We’re excited for the new season of Stranger Things …and so is our new bot. 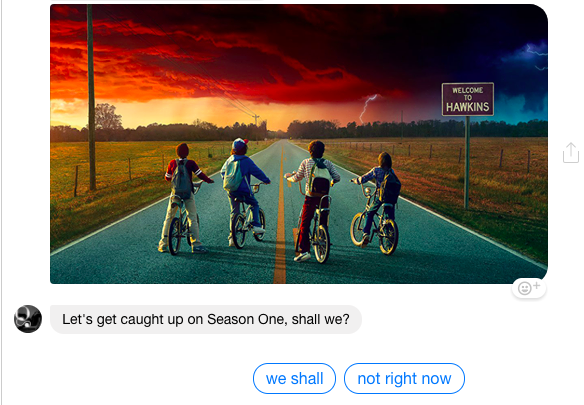 Code name All Things Stranger Things, our bot is a pop-culture companion for _Stranger Things_, the Netflix sleeper-hit-turned-internet-obsession from last summer. To tell you much more would spoil the conversation and the content of the show. Okay, I chatted. Now what? In the week leading up the Season Two premiere (Oct. 27), the bot will converse with ST fans to get them caught up on the first season, point them to the smartest web commentary and fan art, provide a detailed guide to the show’s references, and dispatch other treats for those hyped about season two. In short, what’s there now is just the beginning. What’s the plan for season two? When S2 is released, our bot will be on it.